Almost all of Australia’s native mammals are marsupials. Marsupials give birth to their young and then carry them in a pouch near their belly until the infant is old enough to survive on its own. Another unusual type of mammal is the monotreme. Monotremes lay eggs instead of giving birth to live young. There are only two types of monotreme in the world – the platypus and the echidna – and both of them are found in Australia. 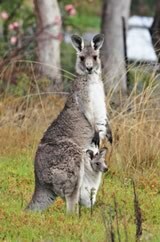 The kangaroo is Australia’s largest marsupial. Kangaroos travel by hopping on their long hind legs, using their tail for balance. They can reach speeds of up to 60 kilometres per hour and can jump distances of eight metres and heights of around three metres. 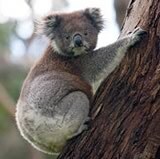 Koalas are tree-dwelling marsupials whose diet consists almost exclusively of the leaves of a particular type of tree called Eucalyptus. Koalas have soft grey fur, large prominent ears and a round face. Their limbs are long and muscular and their paws are broad with long claws. They can be found throughout mainland eastern Australia. Platypuses are found all along the eastern coast of Australia, from Tasmania to far north Queensland. They are small dark-brown furry mammals with webbed paws and a duck-like beak. Platypus leaving the water. Image courtesy of the National Archives of Australia: A8746, KN17/11/71/6.